More than one billion people over the last five years have become new Internet users. Digital connectivity was once confined to economically prosperous parts of the world, but now Internet users make up a majority of the world’s population. 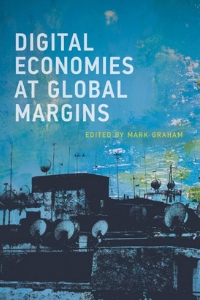 In this book, contributors from a range of disciplines and locations investigate the impact of increased digital connectivity on the people and places at the world’s economic margins. Does a digitalized economy mean that those in economic peripheries can transcend spatial, organizational, social, and political constraints — or do digital tools and techniques tend to reinforce existing inequalities? Reporting on digitalization in countries ranging from Chile to Kenya to the Philippines, the contributors present a diverse set of case studies and develop a broad range of theoretical positions. They consider, among other things, data-driven disintermediation, women’s economic empowerment and gendered power relations, digital humanitarianism and philanthropic capitalism, the spread of innovation hubs, hackathons, the gig economy, and a rethinking of how a more progressive politics of connectivity could look. Mark Graham is professor of Internet geography at the Oxford Internet Institute at the University of Oxford and a faculty fellow at the Alan Turing Institute. He is the editor (with William H. Dutton) of Society and the Internet: How Networks of Information and Communication Are Changing Our Lives.